Richard H. Steinberg, J.D., Ph.D. This Forum is run by Dr. Richard H. Steinberg of the Human Rights Project at UCLA School of Law (UCLA Law) with the support of the Office of the Prosecutor of the International Criminal Court (ICC OTP). 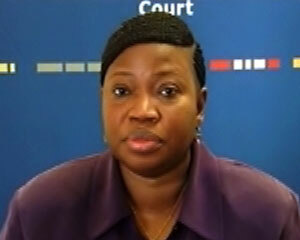 In this video, Fatou Bensouda, the ICC’s Prosecutor, introduces the Forum. The purpose of the Forum is to allow members of the legal community, governments, academics, and others to debate complex issues of international criminal law faced by the Office of the Prosecutor in the course of its work at the ICC. Membership and participation in this Forum are open to everyone. We welcome you to express your opinion, and we request a civil debate which directly addresses the legal issue set forth in the current question. Since its inception in 2002, the ICC has advanced international justice and human rights by embracing new developments in human rights law. As with any emerging body of law, it is important to gather as much insight as possible on highly contested issues. And what better way to share insight than through the Internet? The Forum will deal with one substantive legal issue at a time in the form of a question—we anticipate addressing five questions a year. The questions are developed jointly by the ICC OTP and UCLA Law. Some of the world’s preeminent legal experts on the issue raised by the questions will be invited to give their opinions. The relevant decisions of the Prosecutor or the Judges of the ICC will also be included. Those opinions, in turn, provide a strong foundation for further online discussion. We invite every interested person to register and post their own views on the question in a courteous and polite manner. Posts should be on-point. The Forum does not permit hate speech or ad hominem attacks. Posts which violate the Rules and Guidelines will be promptly removed. Posters who violate the guidelines may be prohibited from further postings. The subject matter that concerns the ICC (crimes against humanity, genocide, gender crimes, and so on) is adult in nature, and accordingly this Forum is not appropriate for children. This Forum is not an opinion poll. It is about allowing voices to be heard, but not counted. The number of posts for or against a certain point of view is not relevant here. What’s compelling is the argument. While the ICC OTP will be informed by the Forum, the Forum is obviously not intended to direct the OTP’s actions. Your first few comments won’t be displayed until approved by our staff. After you’re a trusted member, your posts will no longer require advance approval. By posting on this Forum, an unrestricted license to edit, publish, and republish the material is granted to the Regents of the University of California without restriction of any kind. Some issues discussed in the Forum may be compiled into book or article format for distribution. UCLA Law hopes that this Forum will help provide clarity on the legal positions of difficult, novel and complex issues facing the International Criminal Court. Please join us. We look forward to reading your contribution. Web work on the Forum is by Pipsqueak Productions. If you have feedback or other comments, please send email to info@iccforum.com. Professor Richard H. Steinberg is the Director of the Human Rights Project. A UCLA Professor of Law and a Visiting Professor and Senior Scholar at Stanford University, Dr. Steinberg writes and teaches in the areas of international law and international relations. He is on the Board of Editors of the American Journal of International Law and International Organization , as well as a member of the Council on Foreign Relations . For more information, please visit the Human Rights Project Web page.